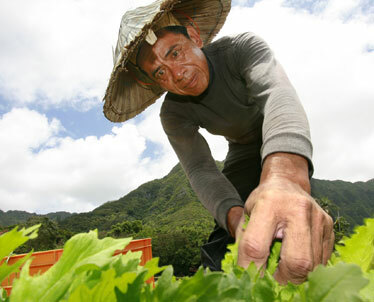 Ruben Remedios harvests greens during a tour of Nalo Farms in Waimanalo. Nalo Farms owner and Hawaii Farm Bureau Federation President Dean Okimoto plans to emphasize local farming and sustainability at the State Farm Fair, which will be held at Bishop Museum this year. This year's Hawaii State Farm Fair will go back to its roots with an emphasis on local agriculture. Admission: $5 for adults, $3 for children (4-12 years old), free to Bishop Museum and Hawaii Farm Bureau Federation members. Admission includes Bishop Museum access. For more information: Call 848-2074 or visit www.hfbf.org. There will be no adult rides -- no Zipper or Ferris wheel -- at the fair, which runs for two days, July 26-27, instead of the usual two weeks. Inflatable bouncers and other rides for children will remain among the attractions. "My concern is ag education. It's not about the rides," said Dean Okimoto, Nalo Farms owner and Hawaii Farm Bureau Federation president. "Those things (carnival rides) tend to attract maybe the teenage crowd that really is not that interested in agriculture." Changing the format to a "grass-roots, fun, family-oriented educational event" hopefully will not hurt daily attendance, said Okimoto. A crowd of 10,000 to 15,000 is expected for the two-day fair at the Bishop Museum. Last year's two-week-long event attracted about 37,000 people. Ryan Lum, owner of the North Shore Cattle Co., said he is glad to see the fair renew its original purpose. "Really it's supposed to be about agriculture." said Lum. "It's gone away from that concept of the country farm fair to more of a carnival atmosphere." One of about 60 scheduled vendors, Lum will sell his grass-fed and pasture-raised beef at next week's event. Kapiolani Community College and Mililani farmers' market vendors will also be at the fair. 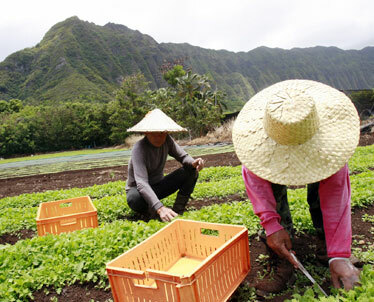 Ruben Remedios and Teodoro Escalante harvest greens at Nalo Farms in Waimanalo. The produce will be available next weekend at the Hawaii State Farm Fair. Despite the higher cost of locally grown goods, Okimoto said supporting Hawaii farmers is especially important now in the wake of the salmonella scare on the mainland. But ensuring crop sustainability is only part of the appeal of locally grown produce. Local vegetables also taste better, Okimoto said, and he plans to prove it, holding a side-by-side mainland and Hawaii taste test at the fair. For the first time since the fair's inception in 1972, Nalo Greens -- Nalo Farms' premier salad mix -- will be on sale. Cooking demonstrations, corn husking and a watermelon eating contest are some of the other activities planned. A shortage of funds was not the reason behind this year's switch. "We have a greater amount of sponsorship this year than ever before," said Okimoto. Besides promoting local farmers, organizers also wanted to bring the fair closer to town. In recent years it has been held at Kapolei Community Park.